The book Meals to Come: A History of the Future of Food by Warren Belasco is one of my favorite books ever. So well researched and written, I could devote a thousand posts to its genius. Instead I'll share an insight from page 217 about the 1933 Chicago World's Fair and American attitudes at that time toward meal pills. While I think Belasco is correct in his assessment that meal pills felt inevitable for many people of that generation, it's important to remember that there were indeed skeptics. Issues of faith and control underlay much of the popular ambivalence about modernism. If, as the slogan at the 1933 Chicago fair proclaimed, "Science Finds -- Industry Applies -- Man Conforms," there is not a lot that Man can do except sit back and try to enjoy the ride. The belief that modernization is both unstoppable and indifferent to individual desires probably explains the persistent popular belief in the inevitability of the meal-in-a-pill, that scary New Nutrition extrapolation. While most people vow and hope that they will never rely on pills for food, they presume future generations will conform to whatever "science finds" -- pills, algae, or other dystopian horrors proposed by the "brave new world of totalitarian technics." I'm fascinated by trends in futurism, but I must always remind myself that people of a given generation are not of one mind. Thinking about the great number of cultural, political and social divisions present in 2010 helps to keep this in perspective. Futuristic themes we find odd today may appear to have been widely accepted in their time, but the fear of a robot uprising in the 1930s, or the inevitability of an incredibly short work week in the 1960s, or building a roof over an entire city in the 1940s, all had their fair share of skeptics. Accurately getting a feel for the acceptance of these ideas is one of the greatest challenges for historians. I'm just as interested in how many people really thought we'd have a jetpack by now as I am in why we don't have that jetpack. 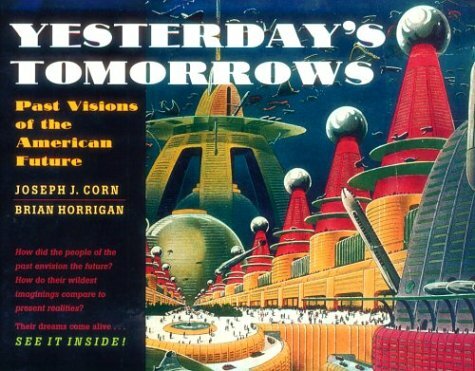 So if anyone has creative ways of gauging public attitudes toward these futuristic ideas of the past, I'm all ears! Well, not literally. I only have two. But will people in the year 2110 assume that the people of 2010 thought they'd all one day have three ears? The image above is from the book Exit to Tomorrow: World's Fair Architecture, Design, Fashion 1933-2005.